I can proudly say that this mod no longer requires DLC. It has manual DLC asset activation built in, so if you ever install DLC later on down the road, you can have the mod grab the assets through menu options in the holotape. This is a really cool mod and I am just starting to explore it. Once thing I noticed as I am using Minutemen faction, the friendlies that show up are a clone army. They seem to be using two base ids 1BF0B7/1BF0BB but when I looked closely I realized they all have the same face and same hair. It's a bit freaky to see a clone army. I would have thought there would be some randomization when they spawned like the base id AC514 - that's the post-quest Minutemen that man the checkpoints and both male & female have the same base id. I have not tried any other factions but I suppose I would have to make sure I am not enemies with who I choose. Is there anyway to increase the amount of enemies spawned for capture missions, as well as lower the friendly count? I would also like to know if the enemies will use weapons from other mods, as they don't really tend to but will very rarely, and only the triggermen faction. I ask all this cause I use the militarized minutemen patch and the amount of NPCs on both sides, coupled with the militarized mod makes the missions over way too fast in my opinion. A cool idea would also make the enemies spawn in waves so it would reduce lag potentially, but they would need to spawn a ways away so they don't end up in the very middle of the friendlies lol. Would it be possible to add Caravan Guard missions similar to the ones in FO1/2. Makes for a good excuse to actually walk to places rather than fast travel everywhere, and they were a great source of resources. I am probably just being really really dumb. I think the mission is loaded, but for whatever reason I cannot find the Holotape/Menus/etc? It's definitely not in my inventory, and I installed F4SE and MCM to see if that was why. Anyone know a fix or something? Does this mod allow for missions that involve hunting Coursers? Fun so far. Thanks for the mod. 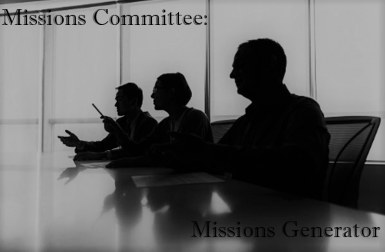 One problem I am having is that setting my mission availability to NO doesn't seem to affect anything. Do you mean you still get missions or just the notifications? I usually just reset my mission pool because of testing, so never really used the Yes/No all that much. When I set it to "no", I still get missions. Are you now on 2.1 of this mod? I usually turn off missions, then reset my mission pool, followed by rechoosing the missions so I ensure the mod knows I mean those. Once I request a mission with Yes back on, they come fast and furious. Are you on PC or Xbox? I am on PC. Will try again with latest version. It's because when you set it to off during a mission the timer for the mission scanner gets cancelled. However, after a mission is completed or abandoned, the mission scanner function automatically is called, starting the timer again. You have to set the availability to no when you are not in a mission. With the update, the function that starts the mission timer sets mission availability back to "yes" to avoid any confusion. If you set it to "No" when you are not currently participating in a mission, then you won't have to turn it off again. HI. I'm at the first approach with your work and it looks very promising, but I'm having a problem: most of the objectives appear under water o.O I've lost some rescue mission just because the captived settler died drowned o.O and so on. Well, I've to confess, it is a bit bothering like that :(. Have I mess with something? Hi! i noticed something a bit strange on a new play through using this mod for the first time. I am using the 155mm Howitzer M1 mod and I noticed the Build able Artillery is Vanilla Mortars. I noticed that your mod have Artillery missions and I think there is a conflict somewhere. I am using the same mods as before except for a Settlement attack mod. Is this mod compatible with Horizon? Where should i place it in the load order?